Horovitz, a wunderkind of sorts, chronicles his glorious times as a caddie trainee at the Old Course in St. Andrews, Scotland, a prestigious golf landmark. With the energy and joy of youth, he describes his gap year, when he took time off before entering Harvard, to which he was accepted at age 17. During that year, he joined the caddie squad at the historic site, with its challenging fairways. A caddie since age 12, Horovitz enjoys the competition of the caddies, the oft-repeated golf tales, the stern discipline of his by-the-book caddie master in the shack, and the pressure to excel at his duties of looping on the links. His interaction with the group of pretty university girls, deemed Model Caddies, is wondrous, as he learns several life lessons from them and the other caddies buzzing around them. 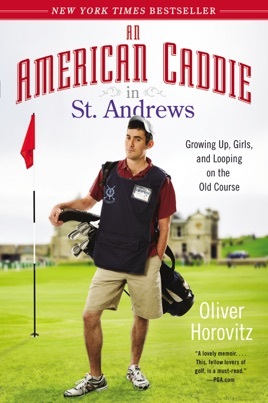 Taking a full course load at Harvard while juggling caddie summers at St. Andrews, Horovitz shares his deeply felt memories of golf, girls, and the academy boldly, never taking himself too seriously or being irreverent about the caddie tradition on the time-honored Old Course links. Even better then I expected and hoped it would be. A funny and heartwarming story of passionately working at the home of golf.